Capturing the beauty of nature in our photos is something we enjoy doing, which is why many of our photos often feature some sort of landscape or rural background. In Canada, we are lucky to be surrounded by so much outdoor artistry. This photo of a groom and his bride with her gorgeous, flowing veil, was shot in the lovely city of Salmon Arm, British Columbia. BC is known for breathtaking landscapes and exploration. Being a wedding photographer in this province means endless creative freedom and opportunity to create stunning pieces of art. This romantic image of the couple sharing an intimate moment captures the essence of Salmon Arm’s nature and scenery. 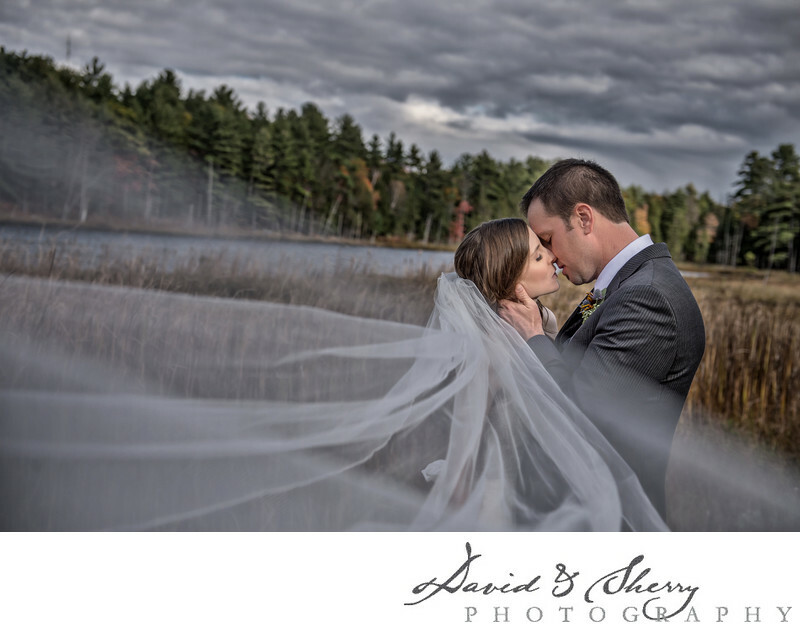 I wanted the couple to be the main focus of the shot, but we were able to capture the evergreen trees in the background, as well as the pond and the dark clouds above. The veil and the groom’s suit almost reflect the clouds with their texture and colours. I chose to darken the image when I edited it to give it a gloomy, rustic look. When working with a long veil such as this one, I always find it interesting to play with it and use it to frame the subject and draw the viewer’s eye toward the couple. Location: 4320 Gallaghers Dr W, Kelowna, BC V1W 3Z8.